Asheville, NC Winter Vacation / Engagement!!! So a lot has happened since I’ve taken some time off from my little blog – I’m expecting! My boyfriend and I are more than excited, we can’t wait to begin our little family. Just the thought makes my heart whole. So during the winter holidays we decided to take a short vacation to Asheville, NC as this is really the only time before my due date at the end of May when we would have more than a weekend to get away. We booked a tiny cabin in the woods through Airbnb – our first time using this site! If you guys haven’t heard of it, it’s basically a service where you can rent people’s personal property to stay in for the night. Like a hotel site but all of the adds are for someone’s home or a room in their home. The benefit of this is having a more personal experience, getting to know someone who lives where you visit and getting away from the tourist mentality of going on vacation. Can’t get that at a holiday inn! At our tiny cabin we were really camping – by that I mean the shower and sink were outside – in the 50 degree weather – and the rain – and this pregnant mama didn’t quite think that one through. It wound up being a fun experiment for a few days but boy I could never live there! That’s our “sink”! And you can see the outdoor shower down below! The woman’s property stretched for about 20 acres on a large hill just outside of Asheville. We drove on a dirt road to get up to her landing area, hiked up a hill in the mud to our cabin, and her property kept going up a steep hill. On our first morning there after showering and getting ready for the day, with fresh coffee from our in-cabin coffeepot, we took a hike up the hill to see the view. 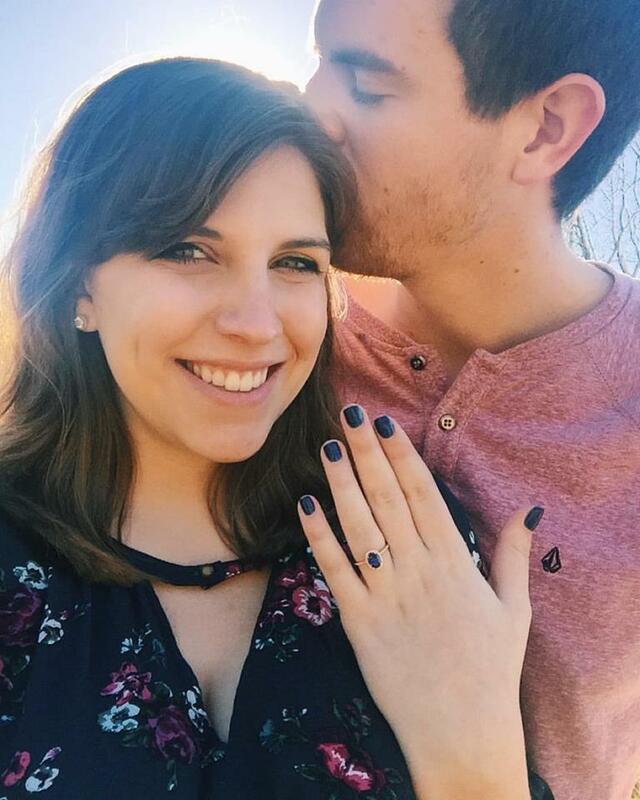 In the warm morning light of December, with a beautiful view, he proposed! The most beautiful, romantic, spontaneous, just-us moment happened on that little hike and I will never forget it. After that we drove into Asheville to get tickets for Biltmore. We bought tickets for the next day, and headed toward downtown to get some lunch. Lunch wound up being second breakfast at Biscuit Head – the most wonderful southern biscuit with all kinds of topping choices. We ordered a biscuit with mimosa fried chicken, sriracha slaw, a sweet jam, and other yummies I can’t remember. We also ordered a version of eggs benedict served on another southern biscuit with arugula, chive cream cheese, fried tomatoes and a side of the bacon of the day – honey bbq bacon! Please promise me if you’re ever in the Asheville area, you will run, not walk, to Biscuit Head. Then we headed out to Blue Ridge Parkway for a scenic drive. We stopped at several lookout points and took in the amazing views. Rolling hills and mountain ranges are some of my favorite things. And windy roads and tall trees are some other favorite things of mine. And here’s my other favorite thing. And then there’s me being a bit silly. I am always co-pilot/crocheter/photographer on our drives and it’s my favorite. Oh yeah, and I had to read a real map with no navigation for the first time in probably ten years and it just about did me in. But I said “no map, I will conquer you!” And I did. And the world was happy again. And as we headed back to our cabin, we saw some beautiful evening light and the world was perfect. All responsibility was lost and we were walking on air. Then we ate Mexican food for dinner and the world was even more perfect. AND THEN a campfire awaited us when we got back to our cabin. Unreal. And that, my friends is a glass of the coveted Biltmore grape juice. The most beautiful wonderful grape juice in all the world. Trust me on this. The next morning we awoke to pulled pork eggs benedict on ciabatta bread from our lovely host. After this magic, we headed out to Biltmore Estate to explore the house and gardens. Notice the crochet slouchy puff beanie from my most popular video tutorial! Carlos got giddy when I closed my eyes while he drove my beloved Forrester through the mud on the property, and I tried to breathe. We went walking around downtown in Asheville and saw some amazing handmade and independent shops – AND I FOUND A YARN SHOP GUYS! By complete accident! The handspun yarn in this place was out of this world and I wanted it all. Look at the jewel on the middle left! Gorgeous. We then headed out to see the new Sierra Nevada Brewery. This was the largest most beautiful beer brewery I’ve ever seen. It had a great self-guided tour upstairs overlooking production. Let me reiterate… this place was something special. We can’t wait to go back!